The D.C. area may have dodged the worst of the storm pounding the Northeast on Thursday, but what if travelers need to get on the road? The advice from WTOP's traffic experts is: Don't. WASHINGTON — The D.C. area may have dodged the worst of the storm pounding the Northeast on Thursday, but what if Washingtonians need to travel into the path of the ferocious storm prepped to drop a foot or more of snow on Philadelphia, New York and Boston? The advice from WTOP’s traffic experts is: Don’t. “Stay off the roads and let the transportation crews do their jobs. Nor’easters, which can drop six to 12 inches or more of snow, have a history of stranding drivers,” said Rob Stallworth at the WTOP traffic center. Schools were closed in Albany, New York City, Philadelphia and Boston. 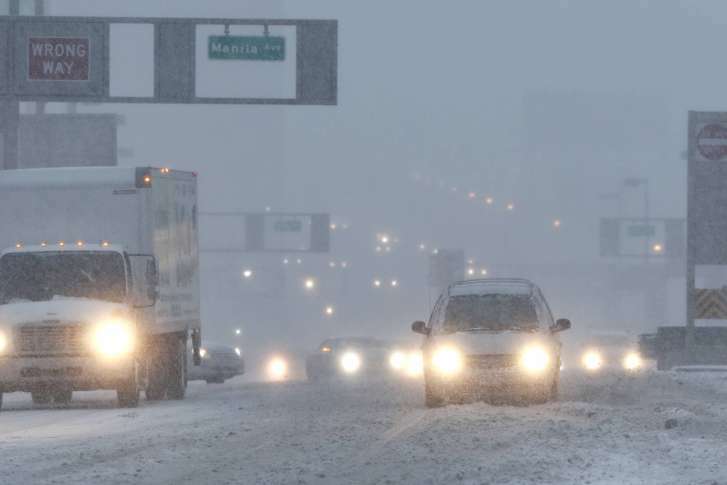 The corridor between Philadelphia and Boston is already rife with wind and snow-swept roads. More than 3,000 flights were canceled by late morning and, according to the New Jersey State Police, there have already been 145 crashes. “You can reschedule that meeting for next week,” Stallworth said. Thursday’s storm comes at a time when the East Coast had been enjoying a bit of unusually warm weather. As of 10:15 a.m., Amtrak was not experiencing any delays or disruptions along the Northeast Corridor — but that could change. The National Weather Service predicted that the Boston area and eastern Maine could get 12 to 18 inches of snow, and a blizzard warning has been issued for all of Long Island until 6 p.m. New York City could see eight to 12 inches; the Philadelphia area, four to eight inches. Near-whiteout conditions were possible, with the snow expected to fall at a clip of two to four inches per hour at its peak. Officials also warned of high winds, coastal flooding and possible power outages. The snow was expected to taper off by the early afternoon in the Philadelphia and New York City areas, but New Englanders were bracing for snowfall through the evening commute.